On Wednesday, March 13, the MacArthur Business Alliance had the opportunity to host Mitch Pally, CEO of the LI Builders Institute, for a discussion about the current and future MTA/LIRR operating and capital plans, as well as an overview of the current discussions in the State Legislature relating to congestion pricing. Joining Mitch was Theresa Ward, Deputy County Executive and Commissioner of Suffolk County Department of Economic Development and Planning. Among the many topics discussed was the East Side Access, allowing LIRR commuters to chose either Penn Station or Grand Central Station as their destination. Full service to those points will begin in two to three years. There was also discussion about the recent fare increase that was approved by the MTA Board (Mr. Pally is a Board member of the MTA. He voted against the increase), which will go into effect on April 1st. This fare increase applies to not only the LIRR, but it also impacts all the bridges and tunnels. Additional trains will be available to and from Ronkonkoma once the third track project is completed. This will allow for reverse commute train service which is currently very limited. It will also provide service every 30 minutes during off peak hours, an improvement over current service. Freight by train across Long Island has increased in the past several years but remains limited, as there is competition in regard to the time available to use the tracks. Additionally, more towns are improving their stations, especially toward the East End, to allow for more convenient transfer of freight. Suffolk County is currently developing a rapid transit bus plan that would to connect the North and South shores. The current suggested routes are on Route 110 and County Road 83. As part of the overall effort to improve public transportation within the county, Suffolk Transit has developed an app to get real-time updates on the bus schedule. Visit https://www.connectli.org/ for more information. 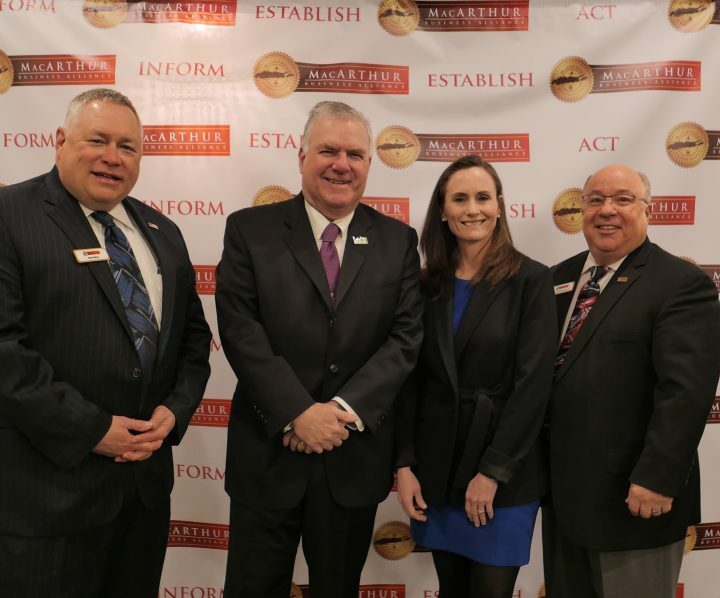 Pictured (l-r) Matt Miller, MBA President; Mitch Pally, LI Builders Institute; Theresa Ward, Deputy County Executive; and Barney Fortunato, Fortunato Sons Construction and Meeting Sponsor.